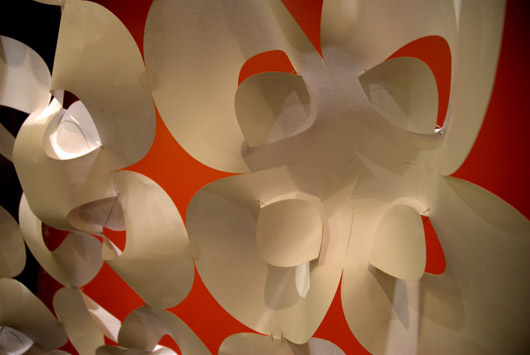 Shaping Light Veil, 2010, drawing paper, 6′ x 15′. Possessing an inquiring interest into how cutting, folding, and bending can potentially transform a flat sheet into a three-dimensional structure effectively bouncing and catching light, Professor Nancy Yen-wen Cheng and two University of Oregon architecture students, Jeffrey Maas and Nicolaus Wright created Shaping Light Veil, currently on view in the Atrium Commons of the White Stag Block. This installation investigates how kinetically changeable surface areas can become light shields, light reflectors, and experimental devices to block sun and create interesting shade patterns of low-cost and high-performance. 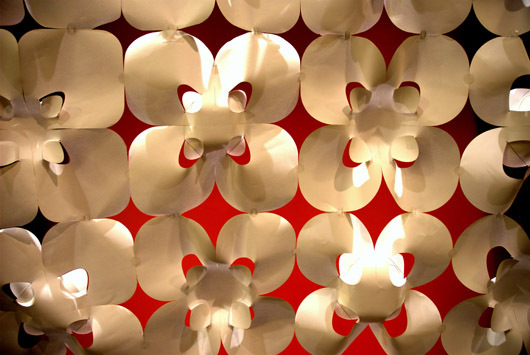 In this piece, modules of the paper screen have been fastened to capture and cast light. The pattern is variable and illustrates the principle of parametric modeling as applied to digital fabrication. Upon close inspection, the modules differ in relation to the distance from an attractor line, the distance is the variable parameter. Created using the Grasshopper plug-in for Rhino, the patterns of this piece were cut and scored with a laser engraver in the University of Oregon’s Fab Lab, managed by UO instructor John Leahy and located in the basement of the Portland White Stag Block. A detail of the installation reveals the farthest modules have square corners with small center openings, while the closest modules have the roundest corners with large round openings. It is fabricated with incredible precision and attention to detail. Initial studies done with student Sina Meier led to explorations of how surfaces can be digitally formed to influence and create enlivening light and shadow. Ideas inspired by Erwin Hauer and Jeffrey Maas that originated during Professor Cheng’s UO AAA Summer Residency were also incorporated. Student Nicolaus Wright created most of the Grasshopper script, down to exact detail that would specify individual length for each wire clip. When I was guiding students to document the White Stag Block’s green building features prior to its opening, I felt that the atrium needed something vertical to dramatize the height of the space. The maroon wall is a perfect setting for something big and bold. If we installed a pulley system, (like a flagpole rope) at one end of the atrium skylight cross-beams, we could hang big banners or hanging sculptures from the top of the atrium. The banner we installed reaches out into the space and makes it asymmetrical. Chairs at the other end of the atrium become places to view, and the white paper sets off the rich red color of the wall. While originally we thought of the banner as backlit overhead canopy, I found that viewing the screen in a more vertical position made it much easier to see the parametric variation and the red background worked much better than viewing the complexity of the atrium. We hoped that the cascading position would help viewers see the motifs both backlit and sidelit. I am interested in experimenting with how we light the paper, as trials with a glassine scrim reduces the harsh contrast and makes the bounced light more legible. 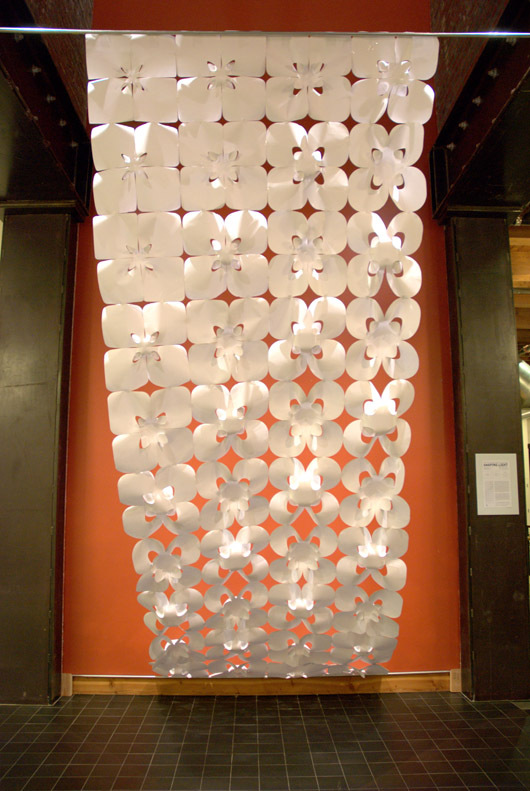 Walking into the White Stag atrium space, the graceful white curved form is abundantly visible and hangs banner-like with a strength and boldness not expected from the medium of paper. Cheng expresses that this curvature was “found serendipitously” from working with the installation as a banner, it is a presence, she remarks that almost gives a “feeling of plenty” to the piece, of fullness in an expanse of white. Commenting on the form, itself, Cheng found inspiration in two images, the Wordplay installation by Xu Bing in the Sackler Gallery in Washington, D.C. which presented colored characters raining down from the ceiling onto a surface, changing from English letters to Chinese characters; the second image, Cheng describes as “more prosaic”—a bridal train similiar to the one worn by Princess Diana for her 1980s wedding to Prince Charles. UPDATE: THIS INSTALLATION HAS RECENTLY RECEIVED AN ADDED LAYER OF GLASSINE.